We have many clients who use Bill.com for cloud-based AP and AR, along with paperless invoice document management, and we have many clients who use SmartVault for paperless cloud-based document management. Bill.com provides a fairly robust work flow platform, it assures excellent quality control and is effective like no other AP system. One of the best innovations of Bill.com is its approval protocol which gives clients wonderful control in the process. Once a bill has been okayed by whomever needs approve it, it gets qued for payment. This is superior to the old method of entering the transaction docs first into QuickBooks, printing the checks to match the bills and then waiting for the checks to be signed manually. When you get in the habit of scanning, emailing or faxing documents into Bill.com, it makes you want to store all documents in Bill.com. 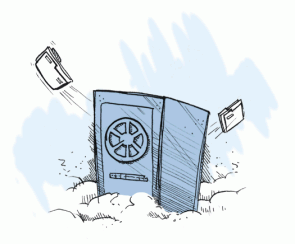 It is possible to do this, however, there are many documents that are better placed and managed within SmartVault. SmartVault provides a folder and file system that easily adapts to the needs of your organization. It is a permission based document management system, thus you give access to each document within the organization based on the staff member’s role with the company. You may also set permissions for clients to see, edit, review documents related to their business. SmartVault also has a toolbar feature where you can attach and store source documents to the record from within QuickBooks and QuickBooks Online, and its cloud drive can be mapped to the local computer allowing for seamless drag and drop functionality.